Hi Dan, thanks for this lovely compilation. I’d love to interact at length with you here about this, but have other tasks that make it difficult to dig particularly deep in the short term so I hope you’re not bothered by me coming and going and commenting in flurries followed by periods of silence. But after all, the interwebs are the home of asynchronous communication, n’est-ce pas? Glad to see you got up to snuff pretty quickly — a couple of months ago when we first chatted you apparently had no familiarity yet with the largest educational study in history. Funny what they leave out of Education Graduate School nowadays. I don’t have much to say initially (there’s a lot here that will take a more concerted effort — and that won’t stop me from blathering on anyway), but I’d like to take on an assumption you make here and in numerous places elsewhere that DI = lecturing, or perhaps ≈. It does not, and certainly doesn’t in the context of interest to this discussion. We will get nowhere if you persist in mischaracterizing the position of those with whom you apparently disagree. Nobody is advocating lecturing as a primary form of instruction in K-8 math classrooms, which is what this discussion is about. As you note, Engelmann’s DI is a particular manifestation of what some call direct instruction, and very unlike your (apparent) favourite straw-man version of the approach. Direct instruction is, simply put, conventional instruction in which the teacher directly conveys information to be learned to the student — this may be done with a wide variety of methods, only one of which is “lecturing”. There is a clear discussion of the usual terms of discourse and some specific manifestations of direct instruction in Anna Stokke’s CD Howe report (p. 5) — I suggest you review this. Note that at no point in her report does Stokke mention “lecturing” — it is irrelevant to the discussion. You’re simplistic categories such as “rote-first” do not capture many, if any, advocates in this discussion. Rote is a word that simply means “by repetition” — it is a tool, no more, no less. Repetition follows initial learning (almost by definition), so it’s hard to grasp what might be meant by “rote-first”. Repetition is a key to automatization of skills and of embedding abstract information in long-term memory, and thus is an indispensable tool for learning. That rote is demagogued by educationists ignorant of its meaning, taking it to imply “without understanding” is no big surprise as repetitive exercises do not fit well with many discovery-focussed approaches to instruction. However, there is no sense in which repetition and understanding are antithetical aspects of learning. Indeed, I would argue that repetition is frequently necessary to properly embed understanding. In any case, they can — and often do — go very well together. Our point is not that we want everyone to adopt Engelmann-style DI. I am not enamoured by DISTAR’s explicit reliance on the behaviouristic model. Currently available systems of instruction such as JUMP Math use a similar approach in which the feedback cycle is less rigid, less explicitly behaviouristic, and produces very similar results to Engelmann’s system in affective, skills and cognitive domains. I believe we have touched on JUMP in our previous discussion — so I won’t go back over it. You have yourself looked at the PCAP Direct v Indirect instruction scale and done your best to run interference on its clear correlation of DI with math scores in that cross-Canadian assessment, which follows more-or-less exactly PISA’s RME philosophy coming from Netherlands’ Freudenthal Institute, which emphasizes problem solving and embedding mathematical questions in “real world” situations. So you know that the “direct instruction” variable used there also does not correspond closely to Engelmann’s system but simply falls on the same end of the spectrum as other “garden-variety” direct instruction systems, consistent with the description Stokke gives. You seem to feel the need to run interference on this kind of information, reflexively supporting discovery learning, perhaps out of sympathy because of its poor performance at teaching novices under any kind of objective scrutiny. It is helpful that you do so publicly, as the public needs to see that the reason teachers follow unproven methodologies is not because they are stupid, or there is some obscure but overwhelmingly convincing proof that they work, known only to teachers … but because the educationists whose job it is to inform them about best practices deliberately skew such information. I am happy to have “live” examples of this to point to. That practice used to be pretty effective, because professional educationists had a monopoly on access to teachers and the research literature was largely inaccessible to the general public. No longer. Today, everyone and his dog can access original research straight from the researcher’s pen, and it is easy to communicate with both teachers and the general public because of the amazing growth of the internet and the networking power of social media. Educationists can no longer operate in isolation from public scrutiny. And it is changing the dynamics of how teachers are connected to the results of research, as the ResearchEd movement testifies by its very existence. So … all I’m sayin’ … keep it up. I’ll revisit this thread, eventually. Found this lurking in my spam folder. 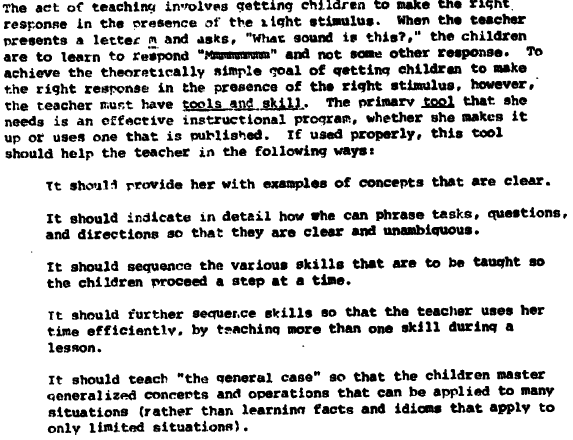 The behaviorist stuff gives a bit of a hint of how some of these things involve conflated axes; it certainly seemed like a lot of the pushback contemporary for that time was on that specifically (which is weird, since the ultra-behaviorist University of Kansas curriculum didn’t do that well). You’re starting to sound a little conspiracy-theorist here. Just to clarify, I am a regular classroom teacher, not an “educationalist”. I did, on this post, go and educate myself by reading 500+ pages of original sources, which I then quote at length about. I was pretty fervent about original sources because other later stuff — including DI websites — seem to have misinformation. I, too, wanted people to inform themselves — that’s why I link to all the actual government papers in question. I was actually somewhat surprised by the results and fully expected DI to come out a winner (with the caveat being that this was a 40 year old study, and something modern would be more useful) but I instead found a bunch of points mismatched with what others have written. I’m going to assume the best and that people weren’t being blatantly dishonest, but more like there was a game of historical telephone going on where the original message got garbled because people were writing about interpretations of interpretations of interpretations (something I’ve seen before). You should back up and try opening your own mind a little, here. Part of what makes all this hard (I might hit this point in a later post) is what Hattie concludes from all his meta-meta-studies that “almost everything works”. The graph is kind of ridiculous — nearly everything has a positive effect if run as an intervention. Some have more positive than others, but it is all tied in with so much context that things nullify each other out. Assigning homework, for instance, has an only marginal positive effect — statistically you could say zero — but I suspect it’s positive in circumstances where students will do their homework (stable families, not necessary for students to have jobs, etc) versus one where it is less likely (more unstable family arrangements which make it harder to get homework done and no habits have been established). In the case of teaching format, I believe we’ve hit adequately here (and you seem to even agree with) that the type of test then used to assess the effectiveness of the format matters. I’m sure school context matters here too. I’ve taught both ends of the spectrum, including University High School (which was in the top 10 of the US News and World Report at the time for public high schools) all the way down to schools with the largest poverty numbers you’re likely to find; while there are some things I can do exactly the same with the same results, the context changes quite a bit what I can do a lesson. Hi Jason. The confusion over the term “educationalist” may be that there is no universally accepted meaning for the word. I used to use the term “consultant class” to refer to the heterogeneous grouping of people who, within the world of education, make it their business to inform teachers about how they should be teaching. This would include professors of math, textbook writers who also “consult”, the various travelling gurus and clinicians (guys like Meyer, for example), independent consultancies and educational research outfits and also teachers who hang out a shingle or blog. The downside of that term was that there was no compact and brief way to explain this term to anyone, and nobody knew what I meant until I did. Getting involved with the ResearchEd movement in UK, I came across their use of the term educationist (or educationalist, a simple variant). As I understand the term it refers to academic side of the theory and practice of teaching; the ResearchEd folks used it as a rubric for essentially the same folks: those people “out there” in the world of education who are seeking to influence how teaching is done, and corresponds almost exactly to my rubric for “consultant class” in this regard — but also includes higher-level bureaucrats in what their education minister M Gove called “the Blob” (for BLOated educational Bureaucracy) a few years back. I freely apply the terms to those within the system (regardless of station) who get involved in such things. Much of the tone and several things I said in that first comment derive directly from my ludicrous conflation of you with Meyer. We have met online on a few occasions and, for reasons I cannot explain, my mind had you and him blurred into a single person … until after I had posted that comment. If a few things I’d said in earlier conversations seemed strange … that might explain it. I find myself much more in harmony with your thinking on a lot of points than with Mr M, so I’m happy to make the distinction. However, we have enough points of departure, even just on this one post, to have some good back-and-forths, which I hope to do (spread over time). In your comment here I am unsure of why you are bringing Hattie into this. For one PFT is not a metastudy — perhaps I misunderstand the caveats you’re bringing in, I’m not sure. For another, as you observe, most of the sponsored interventions in PFT did *not* have positive effect by any of the measures of mathematical skill, cognition and Affective-domain response. So if anything Hattie’s observation only serves as a further indictment of these approaches. I don’t see what, about it, “makes this all hard”. I would think it rather helps to bring the picture into focus. I see no trace here of the Harvard Review volume, for example, that was largely devoted to PFT, or the entire volume of Effective School Practices that compiled articles on the subject and introduced a few new ones. You link to the Glass, House et al critique that was pivotal in scuttling efforts to derive policy implications from the study, but I see no evidence that you have looked at the response response to that critique by Abt associates researchers, or the reply by the U.S. Office of Education. I also don’t recognize any reference to the separate (and quite different) PFT critique by Hodges. You mention the interim report and the Comptroller’s statements about it, but you don’t point out Abt’s qualitatively different assessment of the overall study several years later when their final report came out. You give no evidence of having seen Bereiter and Kurland’s analysis, or that of Becker and Carnine, or Adams or Watkins. 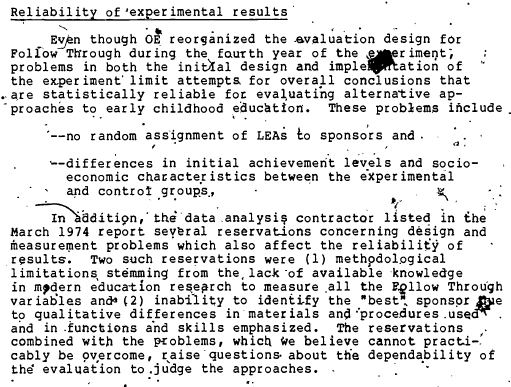 Or Linda Meyer’s study on the long-term effects of DI used in PFT, published in the 80’s. 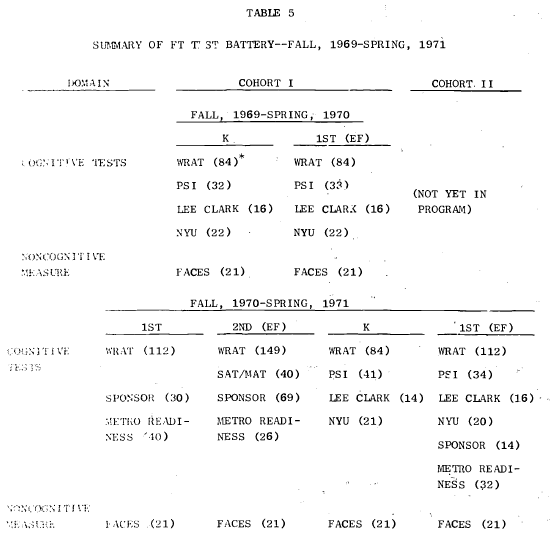 Or Haney’s 1977 summary. You make much of Mathemagentic Activities, although it is given little play in the reports and following scholarship, largely because of the small number (three) of sites at which it was implemented. DI, in contrast, was implemented over 10 sites. You pay a lot of attention to range-of-response data that obscures what typical or average response at sites for a given intervention might look like. For example, an intervention with a single site having one large positive response and several with large negative response would look, in this out-of-focus picture, identical to one with a single large negative response and several large positive ones: Both would be seen as “having a wide range of responses” from positive to negative, end of story. This blurring of distinctions through focussing on range of data rather its distribution and center strikes me as a major part of the Glass-House critique. The effect a single outlier can have in such analysis is particularly important to note in light of the fact that one of the sites listed as DI (Grand Rapids) pulled out from the DI intervention after only a couple of years and adopted a different approach for the remainder of PFT. That site’s scores had a significant negative effect on the DI results (See Becker and Carnine’s analysis) even though it was not using DI, because Abt Associates made the decision to include it in the stats. In turn, I have not considered many of the points of analysis you raise, and I should find some time to read more about them before we dive into things in earnest; don’t know when that will happen, sorry, but I promise to try to return to this. Now Jason, after pressing “Post Comment”, to my embarrassment I see I’ve called you “Dan” and just realised I’ve been conflating you and Dan Meyer in my head for a while. I apologize (if you consider that an insult) and you’re welcome (if … the opposite is the case). I suspect a few allusions I’ve made are incorrect. For example I think it was Dan who confessed ignorance of PFT around the beginning of June, not you. Aside from any such glitches, the rest of my comment stands. Having reread your post in more detail and done some reading, although you work from different sources than I generally do it is easy enough to compare notes, and there is not that much information in it that is new to me, only a very different frame of reference, and I think we can deal with that. It seems on second reading that the primary purpose of this post is to run interference on the success of DI in PFT, so I suppose I should not be surprised on some of the obscurities you placed great weight upon and the rather prominent aspects you left unmentioned or underemphasized. I continue to take exception to your characterization of direct instruction today as consisting of “lectures and notes”. I doubt you could find a direct instruction K-3 classroom anywhere in the continent for which this is an adequate description of the instruction. It is clear what you are trying to do here. I doubt you think that direct instruction advocates today want every classroom to look like a first-year calculus class … but you find it helpful to use language that implies that this is precisely the case. This is dishonest. In particular the strong emphasis on behaviourist methods is uncommon and one may regard it as peripheral to what makes this a “direct instruction” system in the same way that wearing school uniforms in a discovery education class does not make uniforms an aspect that falls under “discovery education”. 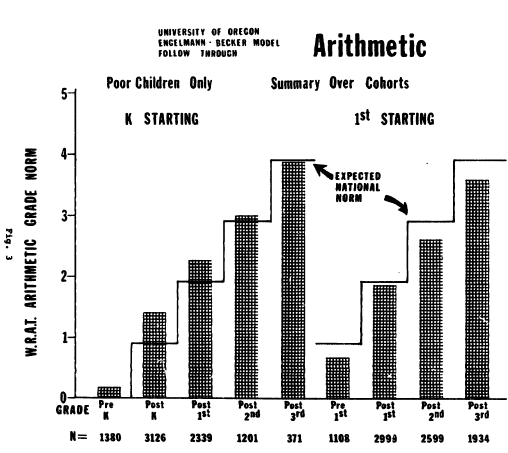 As you can see, JUMP Math seems to consistently produce remarkably strong performance results in the same way as DI has done. I asked Mighton a couple of years ago if he had ever heard of Engelmann’s DI system. He arrived at his system entirely independently (but not through a completely dissimilar process). The comparison in PFT is only one of many ways of parsing “direct” versus “indirect” instruction. There are many different ways to do so and many comparisons have been done, only a few involving Engelmann’s particular form of DI. I believe, for example, you have written about the PCAP 2010 contextual data. Remarkably consistently, direct instruction approaches in K-12 education perform significantly better than indirect independently of who does the parsing and what specific descriptors are use. Hattie, whom you mention, the king of educational metadata, points this out. I was having a debate a year ago with an educationist in Alberta who insisted that Engelmann’s approach to DI should not be taken as a definition of the system (of which he said some elements were good, though he was a discovery advocate himself). I asked him how he would define DI, then. He said that he was an admirer of Hattie and felt that his book gives the best definition of direct instruction. I looked up the definition in the book. Hattie’s definition is a direct quote from Engelmann’s writing on the subject, and Hattie credits him for it in the book. 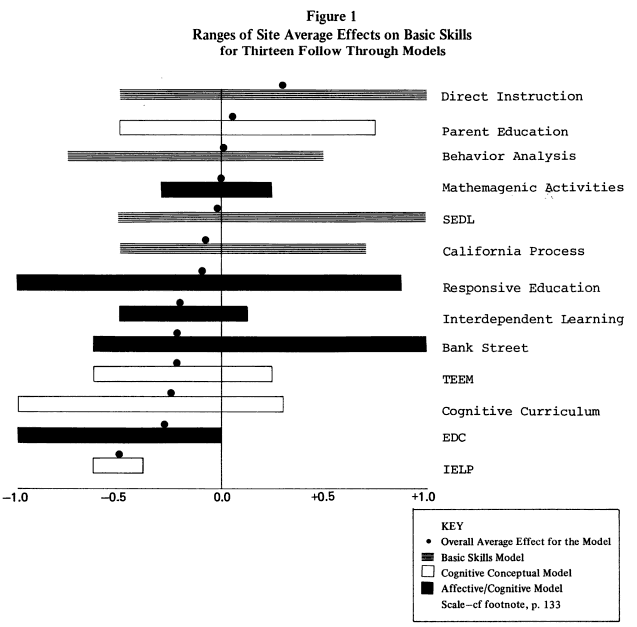 For his meta-analysis on direct instruction, Hattie lumps DISTAR together with many other forms of direct instruction. Seems to me that the distinction in question is a red herring. It appears Hattie (and also, inadvertently, this Alberta fellow) would support that. Direct is direct, whatever other bells and whistles one attaches to it. Indirect is indirect. They are both broad categories and encompass many “named” specific methodologies. I continue to take exception to your characterization of direct instruction today as consisting of “lectures and notes”. For his meta-analysis on direct instruction, Hattie lumps DISTAR together with many other forms of direct instruction. Ayep. My comment earlier was getting at my frustration with lumping. It sounds like you might be frustrated too; that someone who claims their students want the material told to them / examples done / practice done would be categorized wtih DISTAR. Do realize they are pulling out the same types of studies you are to justify what they are doing. I don’t know of anyone who advocates lecturing and note-taking in K-3 classes. I do know of a number of detractors of DI approaches who harp on a recent study of university classes comparing lectures against project-based learning, and who (in complete ignorance, apparently, of the expert reversal effect) believe that this informs the debate about teaching Primary-Grade mathematics (which is what PFT was about). It is not a suitable rubric since essentially nobody teaches or advocates teaching K-3 like that. The only people I see who try to make the case that this is what DI consists of are those who seem to believe it helps make a case against it. I’d rather deal with what’s ACTUALLY on the table, not straw men. In particular you won’t find the word “lecture” in Stokke’s CD Howe report, which seems to have sparked the latest round of debates on this subject. I realize the lecture reference was a bit glib, so I cut it out. Follow Through gets referenced all the time for not just K-3, so I was speaking in general. I possibly should’ve had a point (f.) — any conclusions really only apply to early education, and it’s hard to extrapolate (and this goes both ways, so for instance if someone wanted to run with the mathemagnetic activity thing they’d have to keep that in mind). 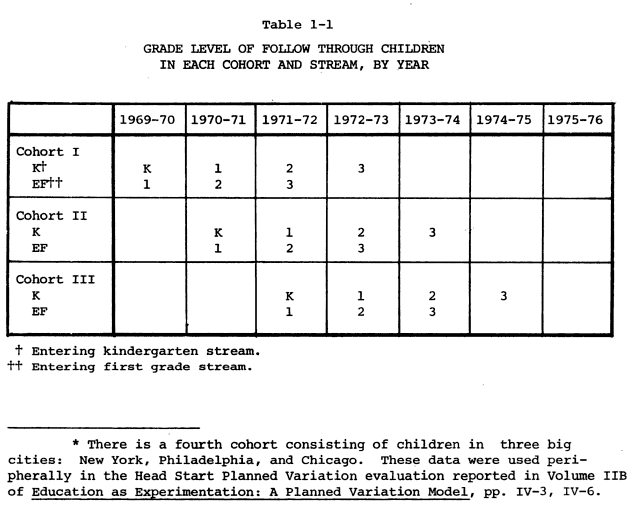 I don’t go so far as to say “any conclusions really only apply to early education” [K-3 that is, not preschool]. However it is quite correct to say that to properly broaden the application one has to be cautious about what this study might imply in other contexts. I believe the expert reversal effect (for one) is a critical barrier to applying what the findings here directly to adult students at university and even to high school education. The game is different when students come into a class with a strong foundation of relevant domain knowledge already in place. Interestingly, I have come across numerous blogs in which studies about pedagogies in university classes are used to draw inferences about early-years education, which is problematic in much the same way. I’ll add to this caveat, because it’s important to understand the context of research: PFT was an intervention for SES-disadvantaged students. As a cohort this group had a baseline performance around the 20th percentile. This was not a study of average-opportunity students (though I think it’s fair to say we have no reason to believe they are not of average intrinsic ability — these are “ordinary kids in unfortunate circumstances”). I find it a bit remarkable that the point about SES is not often raised when people object to follow through. It is an important consideration. It certainly does not mean we can’t draw inferences about other populations, but it does mean that this should be done with cautionary language, or (as we do when we hold this up alongside other studies involving direct versus discovery education) in the presence of multiple lines of evidence that broaden the context of the conclusions. The first thing is to come to the best conclusions we can about PFT as it was performed and in the precise context in which it happened (and you have contributed to that in this post). From there we can talk about other contexts in which some principles gleaned are likely to apply. Hi Jason, one of the main things I needed to do before we could talk at length here was to get up to snuff on the Mathemagenic Activities (MAP) model, which I had heretofore ignored because it was not a major model (because of the small number of sites — only 3 instead of the required 5) and it is not included in the longitudinal data because it was only implemented for one cohort. (iii) with a strong, content-oriented (as opposed to process-oriented) design. From this description alone it is pretty hard to reconcile with, as you say, the “modern ‘discovery’ curriculum”. Each of these three aspects is at odds, for example, with the basic design of materials by (for example) Jo Boaler and Canada’s discovery-ed guru Marian Small. Nevertheless, the point is there that, aside from those three implementational elements, there is a philosophical connection under the surface. That was my view until I started reading the work of Rothkopf, the developer of Mathemagenic Activities as an educational theory in which the Piagetian element is less evident and that he appears to draw more heavily on Vygotsky for the concept of zone of proximal development (which is not strictly a “constructivist” idea) than for anything pertaining to social constructivism. Unfortunately, the writings I could find by Rothkopf were highly specific and didn’t lay out the theory very well, though they hinted at a behaviorist framework. written during the time PFT was still happening, which lays out both the theoretical and the implementational sides of Mathemagenic Behavior (and Activities) — unfortunately only going into detail for Science Education, but it is not hard to triangulate to Math Education. I’ll leave it to you to decide whether you concur with my assessment. I find little in the theory besides sideways references to ideas often attributed to Vygotsky (I’m not sure about Piaget; in any case neither is cited) and that it clearly falls into child-centered instruction (more on this in a sec) that would suggest a similitude to the popular current educational notions of “discovery learning”. As far as being child-centered, I find elements of the program that seem based on the same ideas as self-instruction based on mastery learning. In fact, proponents of MAP actually write about this connection. The idea is that a sequence of questions in small increments lead to mastery of content, whether sequenced through reading materials and workbooks or exploratory questions given by teachers. I’m not sure that qualifies as “child-centered”. I spent a week in June evaluating a “student-centered” remedial system in use at Memorial university to remediate students who are deficient in their math background. It consists largely of a series of workbooks they work through. Teachers are present to provide help, direction and testing. Although it is student-centered in a strict sense that most instruction takes place while the student works on their own through the course materials, it is also Direct Instruction in the sense that material is directly given to the student and they are to learn what they are taught. I’m not “accusing” MAP of being a workbook system — but I do get the impression that it has something of the same flavour, in which the teacher plays “workbook” and the instructional tasks are more discovery-oriented. In fact, I think in the main the theory falls more closely in line with behaviorist theory and practice, with the emphasis on strict, goal-oriented learning, careful programming of instruction and question-and-answer instruction based on eliciting particular desired behaviors in students. I could not have gleaned this from the PFT description, although if you look there are plenty of clues there. I suspect the description in the Abt materials derives from a desire to fit the model more neatly into its classification. The same can be said for the description of Mathemagenic Activities in the OE materials. Again, it appears that the focus is on highlighting how MAP fits into one of the three categories. Also, I disagree, after reading in more detail about MAP, with the Abt judgement placing the system into the “medium degree of structure”. Judging from thes external descriptions I have found of the system it should probably be considered to have a high degree of structure. A couple of other things stand out relative to MAP versus DI. 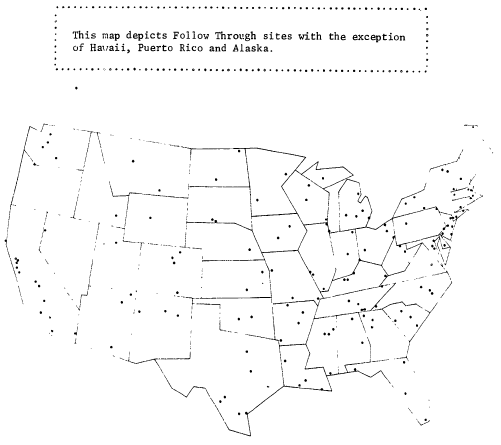 First, the DI FT sites tended to have slightly lower SES and slightly higher second-language and proportion of minority-group scores relative to both the local and global comparison NFT sites, whereas MAP had the opposite — higher SES and lower proportion of English as a second language and minority group students. Make from that what you will. 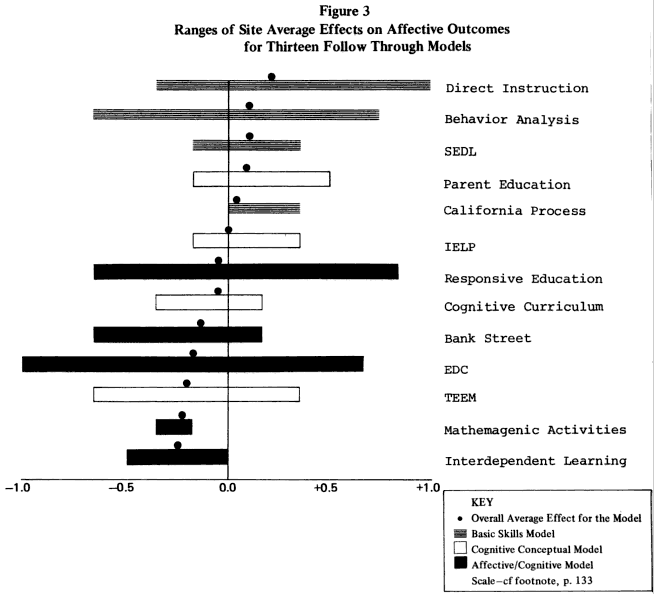 Further, several follow-up studies to PFT are available on the long-term educational benefits of DI instruction through high school and into college (including one well-known hostile “study” associated with one of the other PFT sponsors that suggests DI leads kids to become felons later in life). 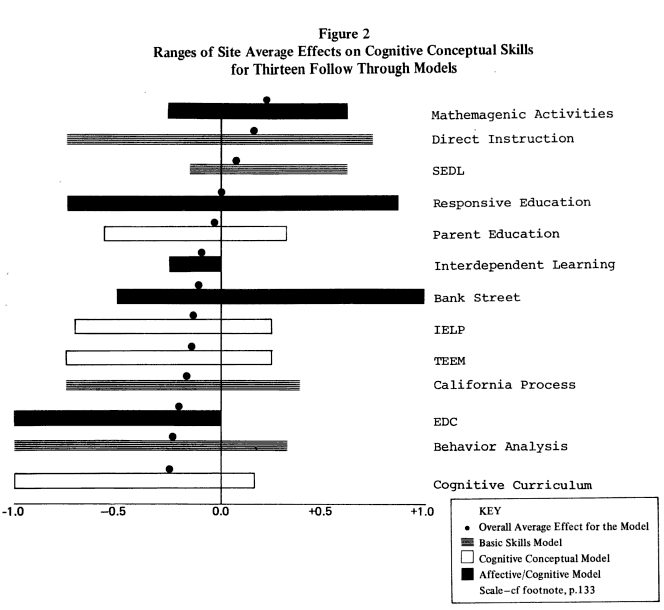 If you’re looking for, as you say ‘what most people would consider closest to a modern “discovery” curriculum.’, how about taking a look at the High/Scope Cognitively-Oriented Curriculum? That is where my vote would be. In fact, reading its philosophy documents alongside Jo Boaler’s writings, I was under the impression for some time that her work is a direct descendant of High/Scope. I confess, however, that I have never found direct evidence of this; I suppose they are independently arrived at. High/Scope is still available and under development, though it seems to me that today it focusses more intensely on early education. A couple of other models also strike me as at least as close to contemporary “discovery” learning as MAP: TEEM, Responsive Education, and the Bank Street Model. But I imagine you’ll disagree with this assessment.